Dashboard allows you to group dimension values and display summaries for entire groups rather than individual values. 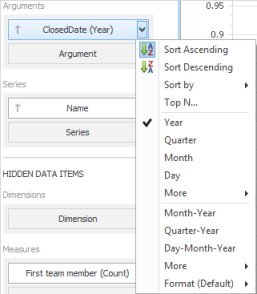 You can arrange dimension values in groups of different sizes by specifying the appropriate group interval. For instance, date-time values can be grouped by years, months, quarters, etc. This topic lists the supported text and date-time group intervals, and describes how to change the group interval. The following sections are available. String values support the following grouping intervals. No grouping Each value is displayed "as is". Date-time values support the following group intervals. Values are grouped by the year and quarter. To specify the group interval in the Designer, invoke the data item menu and select the desired group interval. Less common group intervals are organized in the More submenus. Grouping - InLoox • Copyright 1999-2019 © InLoox, Inc. All rights reserved.